Look at one of your legs. I mean really look at it. Now, imagine waking up and not having that leg. Visualize it. Think about what your life would be like. How your life would change, how you would feel when you looked in the mirror. How friends, family and even strangers would treat you. Think about the things you love to do and if they’d still be possible. Feel the emotion and hold on to that feeling while I share an inspiring story about a man and his message of courage and determination. 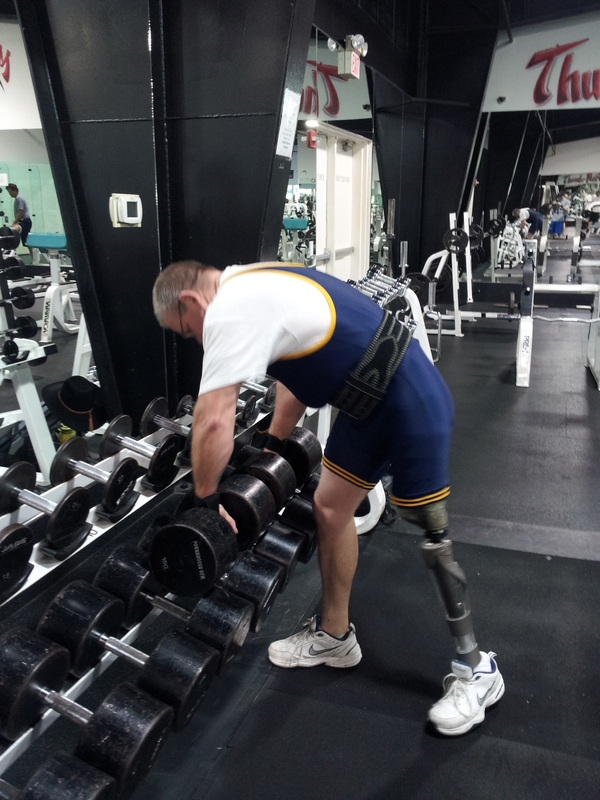 Focused, determined and doing what I love – I was in the gym working out. I tend not to look around all that much because I’m there for a purpose, but this day was different. I glanced up and saw a guy with a prosthetic leg. Let’s face it; this is something that gets your attention, especially in a gym. But what kept my level of attention was his focus and laser-like determination. This guy not only knew what he was doing, but he was doing it with a level of intensity that I rarely see. I thought “More power to him,” and I quickly went back to business as usual. Flash forward three weeks later to Sunday, May 27. I was asked by a friend to be her handler (someone who assists the lifter) at a powerlifting meet. As all the lifters prepared to compete, I noticed one competitor with a prosthesis who looked very similar to the person I saw several weeks earlier. Another attention grabber, this we don’t see often. I walked towards him, introduced myself and asked if he trains at Powerhouse Gym in West Palm Beach. He answered, “Yes I do. Good to meet your Raphael, I’m David Whitehead.” I spoke with David for only a few minutes that day but was inspired by him. I knew in my gut I had to write about David and that people needed to hear his story and his message. I met with David on Saturday June 30, 2012. He shared his personal journey with me, and every moment listening to him was riveting. David’s words, his presence and his contagiously optimistic and powerful outlook made me feel fully alive, and I couldn’t help but think that everyone must have this same reaction when speaking with him. In 2009 doctors said that the only way he could remedy the extreme pain was amputation. David felt he had come to the end of his rope and just couldn’t go on living in this manner. He also said that he just didn’t want his kids growing up watching him exist on pain medication, and that he’d rather lose his leg than have them grow up watching that. “I wanted to be a great role model for them, no matter what,” he said. On March 6, 2009, David’s leg was amputated. From that point on, everything in David’s life would be different. Everything. Try to imagine that for just one moment. It was then, less than a year later, when David decided to do something. 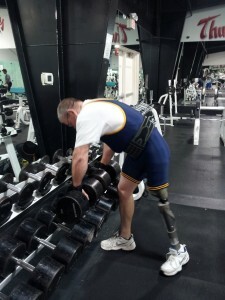 “I was sitting around, feeling like crap, I was even experiencing problems with my prosthetic. But finally after almost a full year, I thought that maybe I ought to just go to the gym. If nothing else, to at least see people.” So in January 2010, David got out and went to the gym. He did what he could, and he said he felt weak and that it wasn’t easy. But he did it anyway. As fate would have it David met someone in the gym named Leo. Leo told David that for his soon-approaching 92nd birthday, he was going to give himself a birthday gift of bench pressing 225 pounds! Sure enough, Leo did it, and that level of inspiration kicked David’s workouts into a higher gear. Time for more fate. 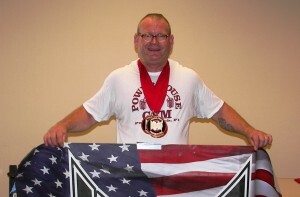 David then met Larry Bucchioni at Powerhouse Gym, and Larry had a very rich history of competitive powerlifting, lots of coaching experience and a mountain of knowledge. Larry spotted David’s strength potential and intensity and told David that he should consider a powerlifiting meet. David’s next meet is on July 14, where his goal is a 300-pound bench press and 155-pound power curl. In January 2013, David will begin deadlifting under Larry Bucchioni’s guidance. We always think that something like this is so far removed from us, that it could never happen to us. Then life has its way with us. But we don’t have to be victims. As we learn from David, life has something for us to learn and something for us to give back, and David has done both in spades. To get more of a glimpse into David’s perspective and humility, he gave great praise and gratitude for his wife and family because they gave him the support, love and strength he needed. 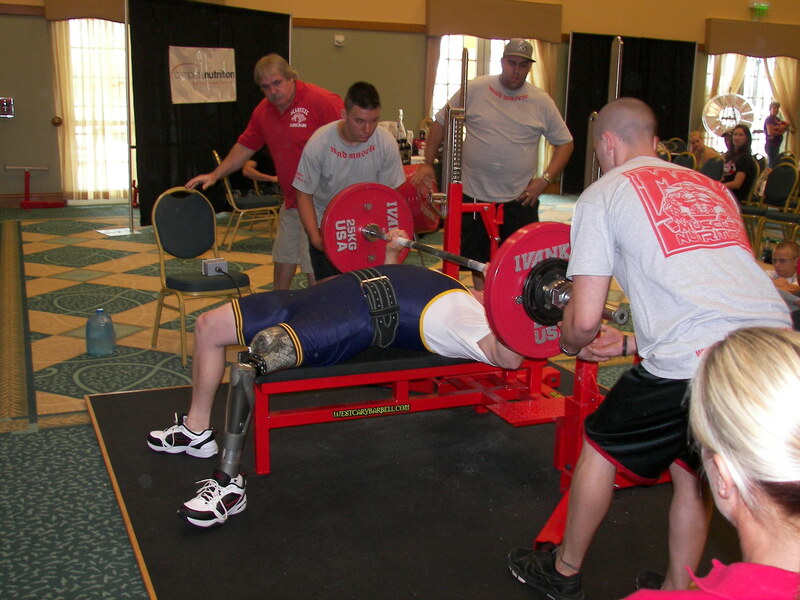 He also gives great praise to Florida O&P Services (which specializes in Orthotics and Prosthetics), where he is now employed, for being immensely supportive of his powerlifting pursuits. Every once in a great while, we meet a person who moves us in such a way and inspires us to such a degree that it helps not only to give us new perspective, but it makes us think about how we define ourselves and what we really and truly can accomplish in life. For all the times you’ve defined yourself as a failure, or think and feel that you just can’t do something, whether it’s losing weight, starting an exercise program, pursuing a new career, or doing something your heart has always wanted to do, David’s message is that “you can.” That you’re stronger than you give yourself credit for, that you have to do the work and your life is waiting for you. That’s David Whitehead’s message. That’s the essence of it. 3 Comments to "Losing A Leg & Gaining Success: The Power of “I Can”"
It has been a pleasure to know you and see all that you have acheived. Keep up the great work! Thank You Raphael for writing this story. This story has been told time and time again over the ages. It is not only mine, it belongs to many. The story is simple but the way you have told it is truely heartwarming and no doubt inspiring. I believe your love for humanity shines through your words. It shows throughout your story but I regret not mentioning that none of my story could be possible without God in my life. Thank you, David. I really appreciate your kind words and have to say again that it was a complete honor to interview you. No worries, your faith in God came through in the interview even without mentioning it.